Cosmonauts Oleg Kotov and Sergey Ryazanskiy work outside the station's Russian segment during a Dec. 27 spacewalk. Expedition 38 is working new science delivered aboard Cygnus including ongoing international and commercial research. The crew is also preparing for its fourth spacewalk in five weeks. Japanese astronaut Koichi Wakata worked on science experiments for students and a commercial organization. Wakata first videotaped a demonstration of the difference between gravity on Earth and microgravity on International Space Station. Later he worked on NanoRacks commercial research gear in the Kibo laboratory on an experiment delivered Sunday aboard the Cygnus resupply craft. After spending his morning exercising, Flight Engineer Rick Mastracchio spent the rest of the afternoon with maintenance work on the Waste and Hygiene Compartment. He replaced urine hydraulic components in the Harmony node’s bathroom. NASA astronaut Mike Hopkins set up the Space Linear Acceleration Mass Measurement Device (SLAMMD) to measure his body mass. Afterward, he continued work with a vaccine experiment using the commercial generic bioprocessing apparatus to help prevent infections on Earth and in space. The Space Linear Acceleration Mass Measurement Device (SLAMMD) follows Newton's Second Law of Motion by having two springs generate a known force against a crewmember mounted on an extension arm, the resulting acceleration being used to calculate the subject's mass. The device is accurate to 0.5 pounds over a range from 90 pounds to 240 pounds. The SLAMMD (Space Linear Acceleration Mass Measurement Device) was installed in the HRF-1 rack during Expedition 11. SLAMMD measures the on-orbit mass of crewmembers by applying Newton's Second Law of Motion (force is equal to mass times acceleration). This device can measure mass from 95 to 240 pounds by using the known force generated by two springs located inside of the SLAMMD drawer. The resultant acceleration of the attached crewmember is measured and the mass then calculated. The Space Linear Acceleration Mass Measurement Device (SLAMMD) is intended to provide an accurate means of determining the on-orbit mass of humans between the 5th percentile Japanese female and the 95th percentile American male. SLAMMD will be rack mounted in a 4 panel unit (PU) drawer and will utilize an 8 PU drawer for stowage. The guiding principle of SLAMMD is Sir Isaac Newton's Second Law of Motion, F=ma (force is equal to mass times acceleration). Therefore, to find mass, the acceleration is divided into the force: m=F/a. For the HRF SLAMMD, the force is generated by two springs inside the SLAMMD 4 PU drawer. The acceleration used in calculating the mass is actually a calculated average acceleration with regression analysis. The acceleration is measured by a precise optical instrument which detects the position versus time trajectory of the SLAMMD guide arm and a micro controller which collects the raw data and provides the precise timing. The final computation is done via a portable laptop computer with SLAMMD unique software. The force is generated by two springs inside the 4 PU SLAMMD drawer. Each spring has Vectran (strong fiber) attached to one end which is fed around a separate pulley and back towards a central cam. The cam is attached to a centrally-located shaft which also has a flywheel and an encoder disk attached to it. The cam is designed such that, throughout the distance the springs stretch, a constant force is applied to the central shaft. This is an important design feature, so that the mass can be calculated using the m=F/a equation. The large flywheel has a lanyard attached to it that is fed through a small slit on the SLAMMD front panel and is attached to a connector. During SLAMMD operation, the latch connector is connected to a latch assembly on the SLAMMD guiding arm. With the cam design and presently selected springs, the force pulling the guide arm assembly inward is constant at 5.25 lbs (23.3 N). For human mass calculations, the crewmember wraps the legs around the leg support assembly like one would for a leg curl machine, aligns the stomach against the belly pad and rests either the head or chin on the head rest. For calibration and control calculations, a calibration arm assembly is attached to the SLAMMD guide arm. Using an 18-pound calibration mass at different lengths from the pivot point, different mass values can be simulated. The range will be from 90 pounds to 240 pounds. SLAMMD is a rack-mounted device. The crewmember mounts the guide assembly and pushes away from the drawer to a predetermined locking position. An electromagnet is activated to stabilize the crewmember in the ready position. The electromagnet comes into contact with the latch attachment plate located on the guiding arm assembly. When the magnet is released the test subject is pulled forward with low-level, constant force. Commander Oleg Kotov and Flight Engineer Sergey Ryazanskiy are preparing for a spacewalk to complete unfinished work from a previous spacewalk. The cosmonaut duo is scheduled to exit the Pirs docking compartment in their Orlan spacesuits Jan. 27 at 9:10 a.m. EST. 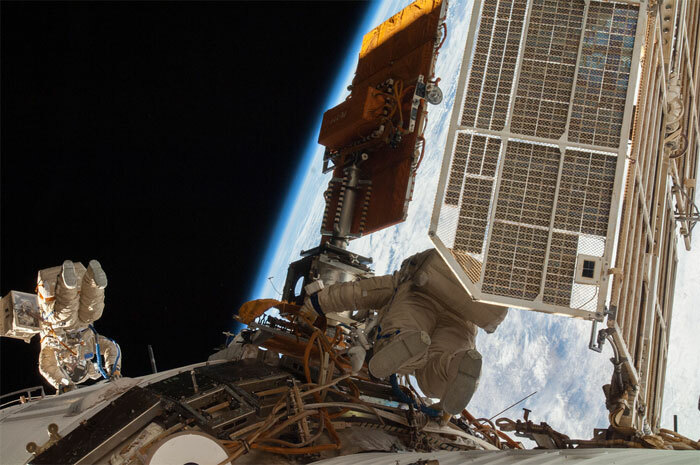 During the previous spacewalk that took place Dec. 27, Kotov and Ryazanskiy installed then removed two cameras that experienced telemetry and connectivity issues. The extra work postponed the jettisoning of experiment gear and the installation of a payload boom. 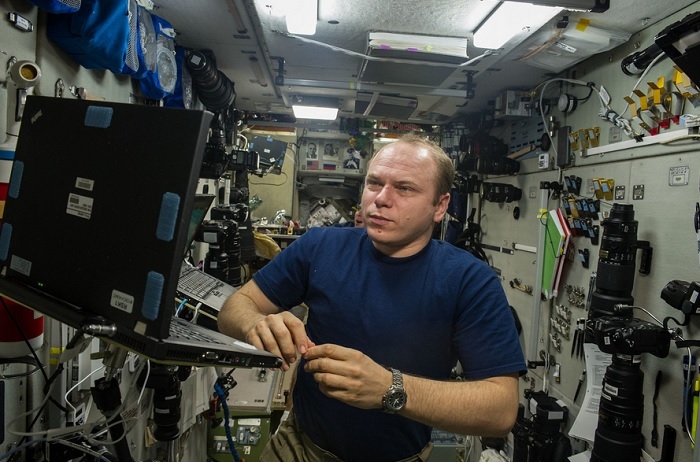 Cosmonaut and veteran station resident Mikhail Tyurin reconfigured communications gear inside the Rassvet mini-research module. He spent the rest of the afternoon setting up sensors to check temperatures and air flows, checking electronics gear and downloading science data collected for the Obstanovka experiment. The six-member Expedition 38 crew teamed up for an emergency drill Wednesday morning reviewing escape paths, safety gear and communication procedures. Afterward, the crew called down to Mission Control to discuss the results of the drill. Astronaut works inside the Destiny laboratory to replace gear on the Combustion Integrated Rack. NASA Television will air live coverage of a six-hour spacewalk by two Russian members of the International Space Station crew beginning at 8:30 a.m. EST Monday, Jan. 27. Expedition 38 Commander Oleg Kotov and Flight Engineer Sergey Ryazanskiy of the Russian Federal Space Agency (Roscosmos) are scheduled to venture outside the space station at 9:10 a.m. in a second attempt to install a pair of cameras on the hull of the station's Zvezda Service Module. The cameras are part of a Canadian commercial endeavor with Roscosmos designed to downlink Earth observation imagery to Internet-based subscribers. The two cosmonauts also plan to retrieve an experiment package housed on Zvezda's hull. An initial effort to install the cameras Dec. 27 proved unsuccessful when flight controllers at the Russian Mission Control Center outside Moscow could not receive data from the cameras. The expedition crew members performed troubleshooting on several cable connectors and now believes the problem has been solved. The spacewalk will be the sixth in Kotov's career and the third for Ryazanskiy. Kotov will be designated as extravehicular (EV) crew member 1, and Ryazanskiy will be EV2. Both spacewalkers will wear Russian Orlan spacesuits bearing blue stripes. The Expedition 38 astronauts wrapped up the workweek Friday aboard the International Space Station with biomedical research and robotics, while their Russian colleagues entered the homestretch of preparations for a spacewalk they will conduct Monday. Commander Oleg Kotov and Flight Engineer Sergey Ryazanskiy donned their Russian Orlan spacesuits for a “dry run” dress rehearsal to test the suits in advance of Monday’s spacewalk to reinstall a pair of cameras as part of a commercial endeavor between a Canadian firm and the Russian Federal Space Agency. The cameras will be used to downlink Earth imagery to Internet-based subscribers. The two cosmonauts also plan to retrieve an experiment package housed on the Zvezda service module's hull. Monday’s excursion will be the 178th spacewalk in support of station assembly and maintenance, the sixth for Kotov and the third for Ryazanskiy. The Caribbean country of Cuba appears at the top of this high oblique image, photographed by one of the Expedition 38 crew members aboard the International Space Station. The cosmonauts will wrap up their preparations on Sunday as they take care of some final details and study the timeline. Live NASA Television coverage of the spacewalk begins at 8:30 a.m. EST Monday, with hatch opening scheduled for 9:10 a.m. Commander Oleg Kotov looks at a computer monitor in the Zvezda Service Module of the International Space Station. Russian cosmonauts Oleg Kotov and Sergei Ryazansky are to re-install photographic and video cameras made by the Canadian UrtheCast Company on the service module Zvezda (star) of the Internatonal Space Station (ISS) on Monday, an official in the press service of the Flight Control Center (FCC) outside Moscow told Itar-Tass. "The opening of hatches (for egress) is scheduled for 18:10 on Monday and their closure at 00:10, Moscow time, on Tuesday. The overall duration of extravehicular activity by ISS mission commander Kotov and flight engineer Ryazansky on the outer surface of the Station is to be six hours. During this unscheduled spacewalk, the cosmonauts are to finalize the work which they did not manage to accomplish during the previous spacwalk in December last year," the FCC official said. The high-resolution cameras, which are to take pictures of the Eart from the outer surface of the ISS and the manufacture of which had taken three years, were brought to orbit by the Russian resupply spacecraft Progress M-21M on Novembr 30, 2013. During the spacewalk on December 27, last year, Kotov and Ryazansky secured them on a special platform on the hull of the module Zvezda and attached the wires. However, the FCC was not able to receive telemetric data from the cameras. The cosmonauts had to dismantle them and bring them bact to the Station. Specialists managed to establish that the lack of signal was caused by malfunction in one of the ISS cables. The cameras are designed to transmit the pictures of terrestrial surface round-the-clock. 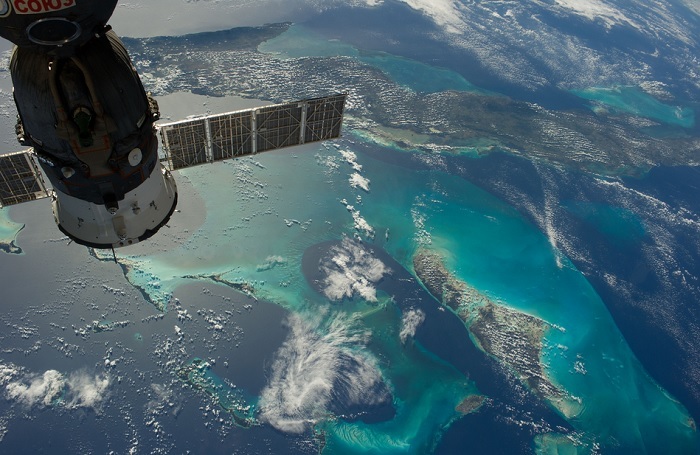 "The hull of the ISS is the ideal place for fixing the cameras that will enable people down here to have a space view of themselves without control on the part of any government organization," Dan Lopez, the UrtheCast director for technology, remarked earlier. Any Earth dweller, who has access to the Internet will be able to admire the pictures of the Earth on the website of the Company free of charge, he added. According to Larry Reeves, one of the leading engineers of the Company, the pictures to be received from the cameras will be placed on the website with an about one hour lag. The cameras are capable of taking pictures and do video recordings, with a spatial resolution of one metre, of a vast territory stretching from 51 degrees, northern latitude, to 51 degrees south. The territory accounts for 90 percent of the planet's population. On pictures taken by the cameras, one will be able to discern motor vehicles, aircraft, sea-going ships, buildings, stadiums, and groups of people bu not their faces. Provision is made for paid services for thosew ho would want to direct the cameras to show some specific place on Earth. The UrtheCast Company expects that among its clients there will be governments, organizations and corporations. According to Scott Larson president of the Canadian firm, it would be possible to use information to be received from the cameras for educational and environmental purposes, to trace the migration of animals, to estimate the condition of forests and farmland, the pollution of water reservoirs, and the aftermath of earthquakes. International Space Station Expedition 38 Commander Oleg Kotov and Flight Engineer Sergey Ryazanskiy of the Russian Federal Space Agency (Roscosmos) completed a 6-hour, 8-minute spacewalk at 3:08 p.m. EST. The spacewalkers installed a pair of high-fidelity cameras on a platform attached to the Zvezda Service Module. The cameras are part of a commercial endeavor between the Russian Federal Space Agency and a Canadian firm involving the downlink of Earth imagery.